Caramel Apples are so hard to eat. But Caramel Apple Smoothies? Those are so easy to drink…and make! Do you make a fall bucket list? Every year I tell myself I’m going to do it. I’m going to make that fall bucket list of things we MUST do before the holidays. I include things like go to Apple Hill, visit a pumpkin patch, make caramel apples, and jump in the leaves. And then I feel like a total failure. I should just stick to fall bucket lists like this one for food bloggers. All of those are just a given. Now, if you’re a fall bucket list making person, I can guarantee you have caramel apples on there. I love caramel apples that aren’t an actual caramel apple. The real thing has just never appealed to me, but sticking caramel apple flavor into blondies, magic bars, gooey bars, cake rolls, and cinnamon rolls is something that I love to do on a regular basis. Now I can add Caramel Apple Smoothie to that list! I’m super excited about this caramel apple smoothie recipe, you guys. It was so darn good and it’s so much healthier than a regular caramel apple. Jordan LOVED it, which I knew she would. The recipe was created for kids like her, after all. This fall smoothie comes from my friend Deborah Harroun’s newest book, Best 100 Smoothies for Kids. (Deborah is one of my blogging buddies over at Taste and Tell. I reviewed her Red Velvet book last spring.) It’s a book full of nutritious smoothies that taste good and have no added sugar. The book is full of delicious recipes for smoothies for any time of day: Strawberry Banana Oatmeal for breakfast, Berry Broccoli (they’ll never know) for lunch, and Creamsicle for snack. She’s even got recipes for holidays, like Carrot Cake, Gingerbread, and this Caramel Apple Smoothie. 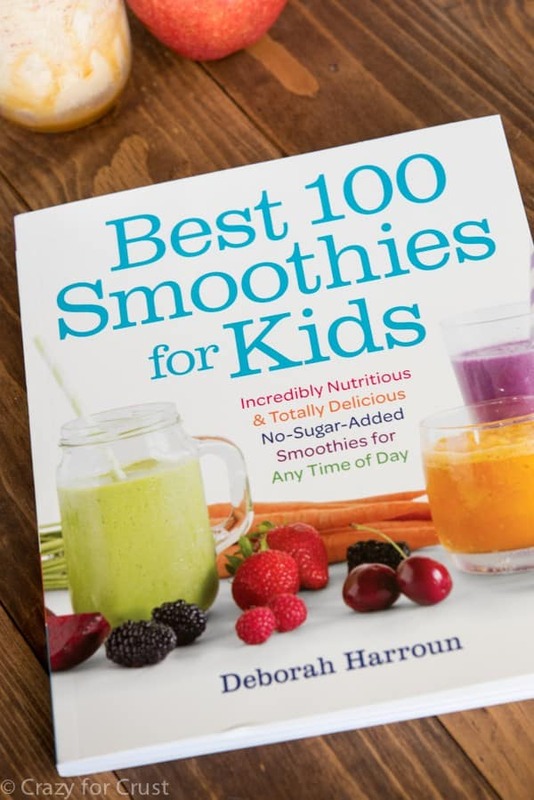 The book is full of smoothie making tips and kid-tested recipes and we love them all! When flipping through her book, I knew I wanted to make the Caramel Apple Smoothie first. I mean, what’s more fall than that?? Plus, Jordan was begging for something sweet but I wanted her to have something healthier. 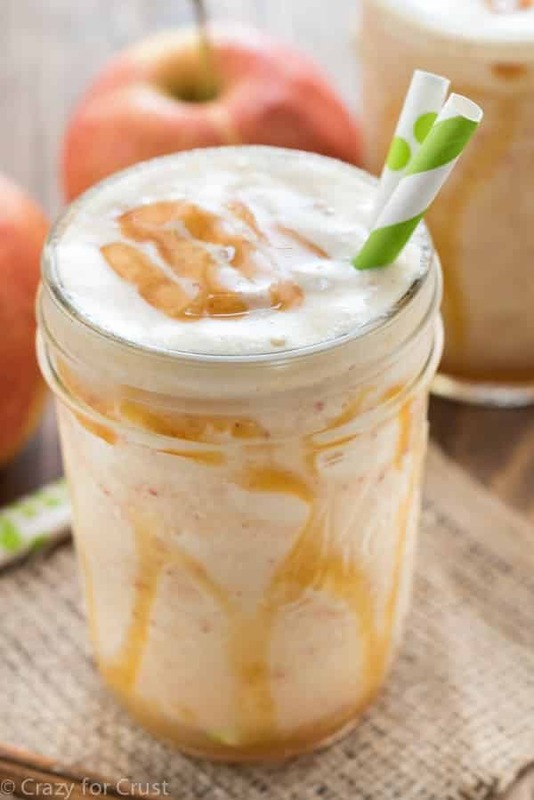 This is an easy smoothie recipe with just a few ingredients: milk, apple juice, diced apple, and sugar-free caramel sauce. I used almond milk in my smoothie but you can use nonfat milk or any kind of milk you like. You can also use any apples you like most – I used a Gala because it’s a little sweeter than Granny Smith and Jordan prefers them. Simply add all the ingredients to your blender with some ice and blend until smooth. I added a little extra caramel for garnish (because, duh, more caramel > less caramel) but you don’t have to. This is the perfect smoothie for after school or dessert. You can even add some flax or Greek yogurt to it to give it more fiber or protein. Trust me, your kids will never know this is healthier than Jamba Juice or a cookie. Or even a real caramel apple! 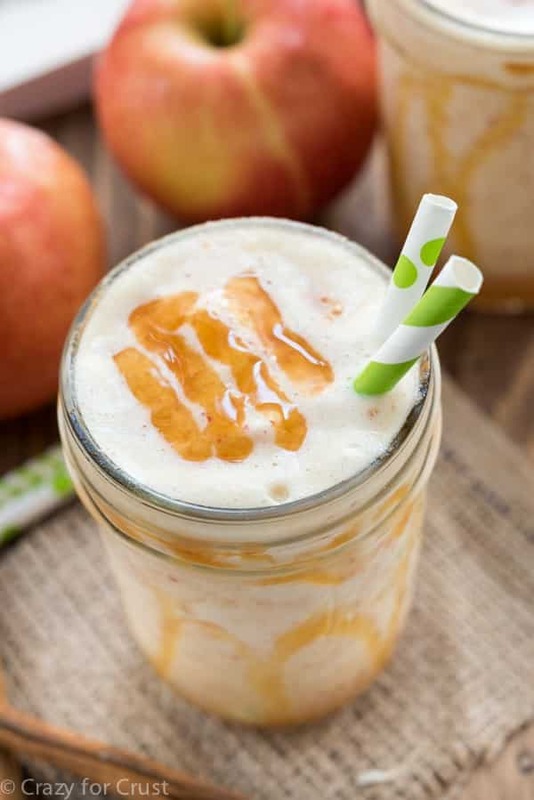 This refreshing easy Caramel Apple Smoothie is actually healthier! 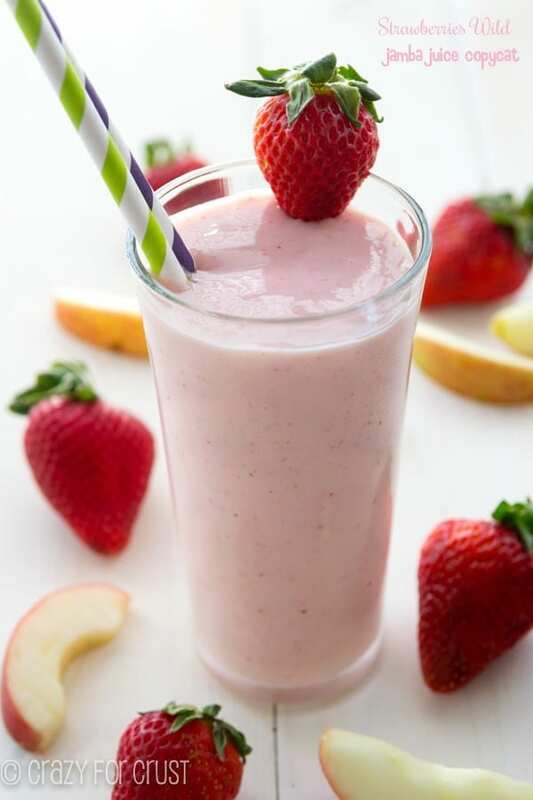 This smoothie is a great breakfast, snack or dessert options for kids and adults. Pour the milk and juice into a blender. Core the apple and cut it into chunks. Place it in the blender then add the caramel and ice. Blend until smooth. Optional serving suggestion: top with additional caramel sauce. I’m still trying to finish my summer bucket list! Seriously, I’m going paddleboarding in two hours. Terrified. Can’t think about the fall bucket list yet, but it will definitely include the fall trip to the apple orchard to get the best caramel apples on earth. And you can bet this smoothie is now going on that list. And buying that book! I just read your post on it!! I was terrified when I did it the first time! This looks delicious- so perfect and seasonal. And the carrot cake and gingerbread sound out of this world, too! I love that this isn’t loaded up with sugar and that you still get the caramel apple flavors, minus a bazillion empty calories! I’m so glad that you and Jordan are enjoying the book! And this smoothie is the perfect way to ease into fall. xoxo! Oh.My.YUM. 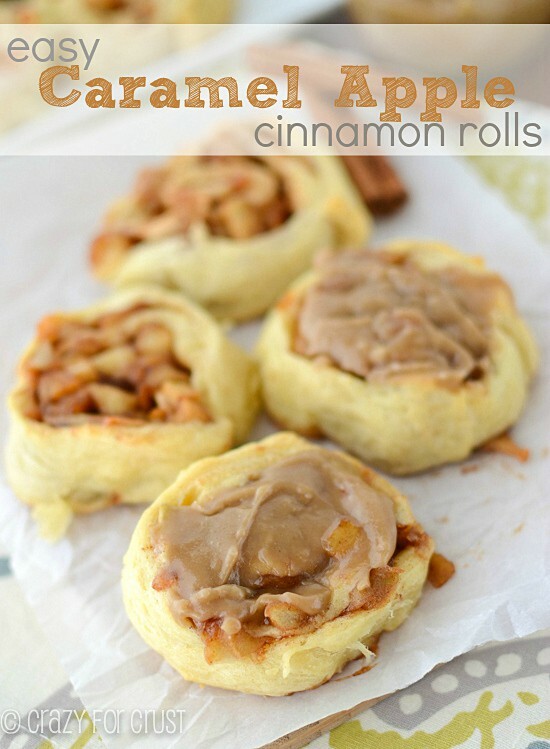 I love caramel apple ANYTHING and this sounds absolutely amazing. I think I have the ingredients to AT LEAST approximate this! WOOHOO! I am definitely buying that book – a good way to sneak in nutrition to a fun drink. My difficulty with bucket lists is the one I make for Christmas – there really isn’t much time between Thanksgiving and Christmas. I have to pare it down! Where would I get sugar free caramel syrup? You can find sugar-free caramel by the other ice cream toppings. Smuckers makes it. If you don’t want to use SF, you can substitute regular ice cream topping! 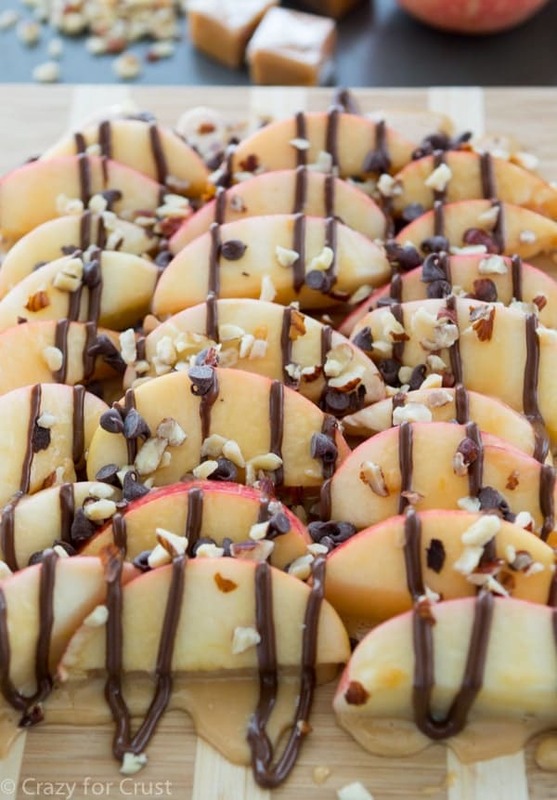 I love the emergence of all these wonderful fall recipes! This smoothie looks great! This sounds so amazing I never actually put apples in my smoothies. I can`t wait to give this a try. My bucket list is more geared toward Christmas, but I hear ya. Soon before you know it, Christmas will be here (eek!) and I won’t have completed anything on my list. Sigh. Time moves too quickly when you’re an adult! Love this smoothie! I have one for that that never gets done either!! Pretty sure the kids aren’t the only ones loving this. This is my kind of smoothie! I am always left with a list of things we didn’t do at the end of each season — life just goes way too quickly! It’s my kind of smoothie too! Caramel = yum! This sounds like the perfect smoothie for my daughter. She is a huge fan of taking smoothies to school for breakfast. I’m off to get the book to get me more ideas during the morning breakfast routine! There are tons of great breakfast smoothies in the book too! Enjoy! I just HAVE to try this smoothie. I love caramel apples, and caramel apple flavored things (and did I mention now I need to go back and try your blondies, and cinnamon rolls!) but this smoothie. YUM! And I think I need to get my hand on that book. I love Deborah and just know I’d love that book! The book is amazing!! Thanks for reading! amazingly yummy smoothie! I love breakfast again!